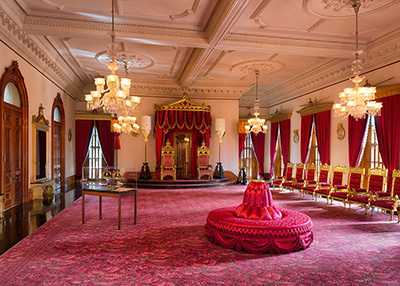 The Friends of Iolani Palace is committed to accommodating the diverse needs of our visitors. Please advise the ticket office of any special requirements when making reservations or purchasing your tickets. 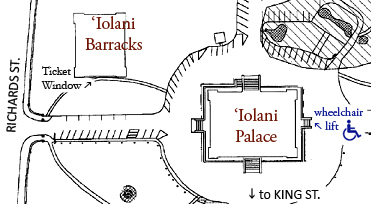 All public areas of Iolani Palace and Iolani Barracks are wheelchair accessible. Motorized scooters and electric wheelchairs are not permitted in the Palace itself. A limited supply of standardized wheelchairs is available for use inside the Palace for those visitors who are unable to use the stairs, and we recommend reserving one in advance. These wheelchairs are available on a first come, first served basis, free of charge. Upon ticket purchase, please inform the cashier of special requirements. A visual tour, complete with captioning, is being developed for instances when the lift is being serviced. To make a reservation, please call (808) 522-0832. Docent-led tours are given in Japanese Monday-Saturday at 11:30am, subject to docent availability. With prior request, Japanese language tours can be made at other times. Guided tours can also be arranged in Mandarin Chinese. Pre-recorded audio guides are available in eight languages: English, French, German, Hawaiian, Japanese, Korean, Mandarin, and Spanish. With prior notice, an American Sign Language (ASL) interpreter can be arranged for Deaf individuals or groups. Additionally, a printed version of the audio tour script can be requested on-site or downloaded here. With prior notice, special touch tours can be arranged for blind and partially sighted individuals or groups.